Hollow-core surfboards have always been a little off the wall, but none has looked as radical as Mike Sheldrake’s wave vehicles. A Sheldrake board is stunningly transparent. Its core is a matrix of ribs running three directions. There’s no foam, just fiberglass skin over computer-cut cardboard. He’d aced calculus, so he could handle the curve math. But for the structure? “I thought I’d go a different way from the 90-degree designs most people do,” he says. “Triangles are stronger.” He sat in a café sketching, and hit upon a pattern of triangles and hexagons he calls the quarter isogrid. After a week of designing, he was convinced it was doable. Six months later, his cardboard prototypes actually turned out tough enough to surf. 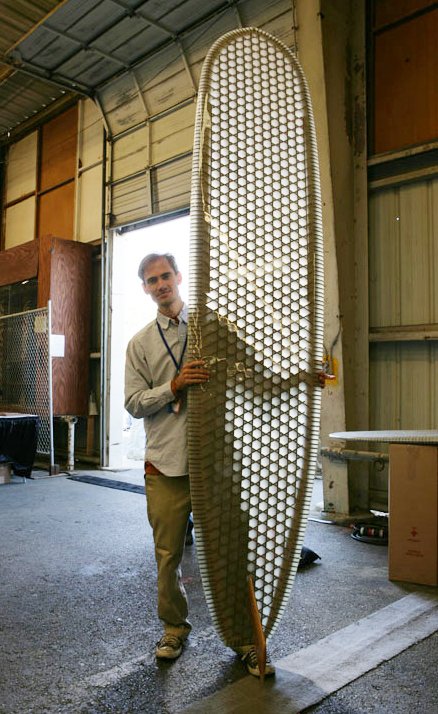 In his garage in Orange, Calif., Sheldrake cuts the ribs from ordinary 4mm corrugated cardboard, using a Next Wave Automation CNC Shark fitted with a RotoZip spiral saw. Each cross-section is output from his own surfboard CAD software, rendered by his network of Linux, Windows, and Mac machines. When the last piece is cut, he slots it all together, and then skins it in fiberglass and epoxy resin. Prototype problems are what you’d expect — leaks and delamination — but Sheldrake says his boards are standing up to typical abuse in the surf zone. Soon he hopes to help surfers design their own boards on his website and then buy pre-cut kits to assemble. But first he’s investigating better rib materials, Gore-Tex vents, and other improvements. Why go cardboard? It makes lighter longboards, he says, and leaks can be dried in a day instead of weakening the board over time. Best of all, instead of buying $900 boards, he can now make them for about 150 bucks.